This oval dial is of very simple manufacture. The decoration consists mostly of punched stars and circles, coloured in red, green and black. 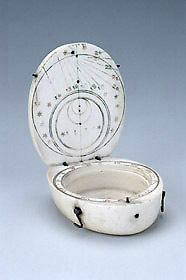 The compass bowl is rather deep and it probably held a painted and floating card common in Italian dials, hence the attribution of this instrument.